Hereford Dining Table is a stunning, extremely well designed dining room table that will add an elegant feel to your homes surroundings. This table can seat up to 6 & 8 people down the sides, and is ideal for family parties. This Dining Table is Medium & Large Size Available. 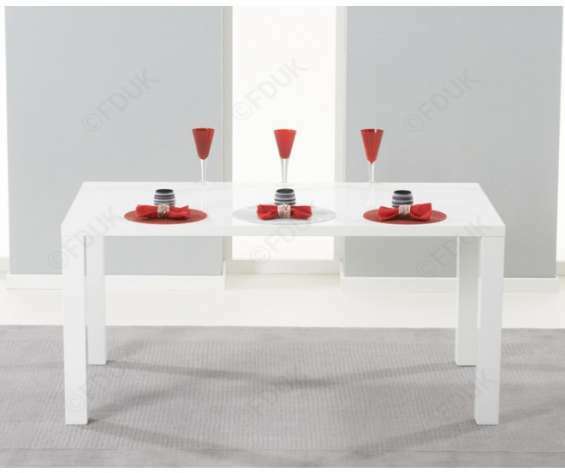 Hereford Dining Table is MDF with White High Gloss finish with clean, crisp lines for a distinctly contemporary style. This Dining Table top can be easily wiped clean should you spill any food upon it. Hereford Dining Table manages to combine stylish good looks, durability and a high level of practicality for the modern dining room interior. Mint 5d mark ii 21.1mp +24-105 "l" lens many extras!